On June 5, 1906, 18-year-old Gertrude Margaret Bauman took the short carriage ride from her parents’ home at 71 East Livingston Avenue in Columbus to St. Mary’s Catholic Church. There, she married John Frederick Heinmiller, a plumber who worked with her father. After their nuptial Mass, the auburn-haired bride and her groom, 11 years her senior, returned to the garden of the Baumans’ home for a wedding breakfast. 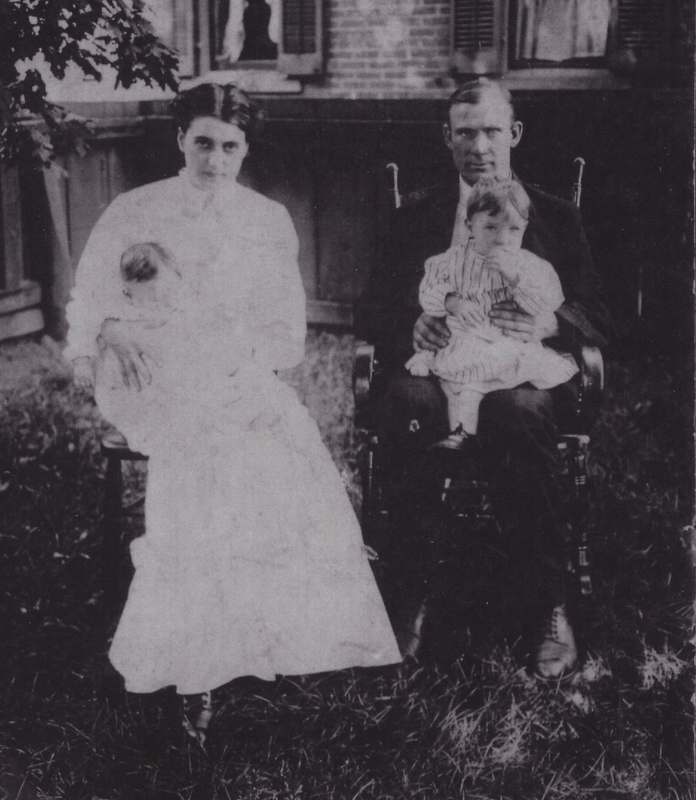 Here they are around 1909 with their first two children. My grandpa, Jimmy, is on his father’s lap. His brother, Jack, is held by their mother. “Gert,” as her husband called her, was a talented seamstress who enjoyed writing poetry for her grandchildren’s birthdays and singing her favorite songs. 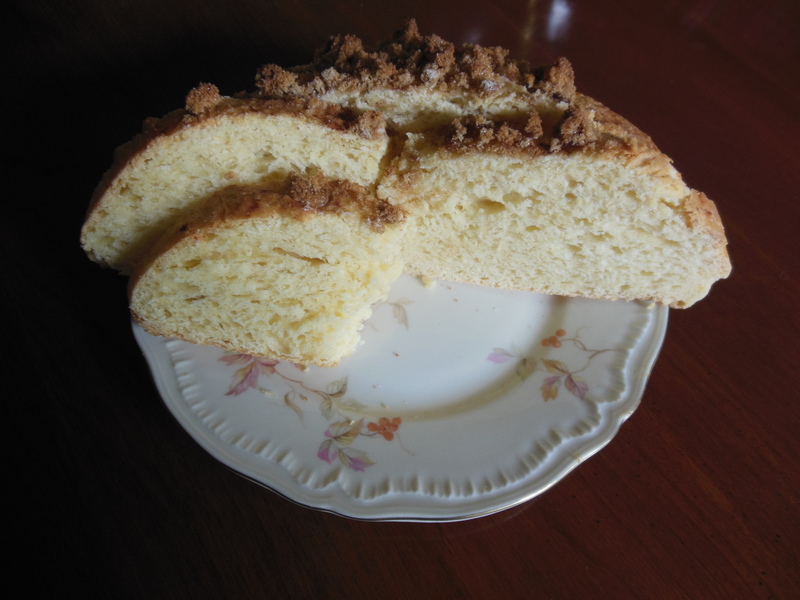 Among her nine surviving children and their families, she was best known for her coffee cake. Every week until she died in February 1955, after she and her husband returned from their Saturday-morning shopping trip to Central Market, she would make myriad loaves of this treat to share with her children. After going to church, each son or daughter would stop by their parents’ home at 1514 Studer Avenue to visit them, claim two of the cakes that were lined up on the kitchen table, and take them home for their family’s Sunday breakfast. Here are Gertie and John with eight of their children on their 34th wedding anniversary, June 5, 1940. The ninth one was probably behind the camera, taking the picture. Grandpa loved his Ma’s cake so much that my grandmother wrote her mother-in-law’s recipe for it in the cookbook she received from one of her friends as a wedding shower present. In honor of my great-grandparents’ 107th wedding anniversary this week, we pulled out Grandma’s recipe book and whipped up a batch of Gert’s coffee cake. Although it’s a simple recipe, it’s time-consuming — the yeast dough has to raise three times before it’s baked. Here are some slices of the streusel-topped cake on a plate of Haviland China “Autumn Leaf,” a pattern developed as a premium for the Jewel Tea Company in 1927. Gert acquired dozens of pieces of “Autumn Leaf” to use for the weekly Sunday dinners she fixed for her family. If you’d like Gert’s recipe, leave me a comment and I’ll send it to you. This entry was posted in Family, Food/Restaurants. Bookmark the permalink. Thank you so much for writing this! I will add it to my family history collection. I would like a recipe, when it is convenient. Betsy, this is a wonderful memory. We all absolutely loved the “Kuga” (phonetic) every Sunday. pieces available for purchase from ebay and elsewhere. I just may buy some for old times sake. What a great memory, Betsy. I have an 8 place setting collection of the Jewel Tea Autumn Leaf pattern that I inherited from my grandmother. Every Sunday and holiday when I was growing up we ate off of these lovely dishes. Your great grandmother’s recipe sounds like it is worth the work. Please send me a copy so that I can try it. Thanks for sharing. I would love a copy of your coffee cake. I am always searching for a great coffee cake recipe. As a young bride with little cooking experience, my mother-in-law gave me several boxes of the Jewel Tea coffee cake mix and I thought it was great. Through the years I have searched for the a recipe that somehow may resemble it. While searching for Jewel Tea.I found your blog. However, looking at your recipe it appears that it will be much better than the Jewel Tea’s. After years of experience in cooking and recipe collecting I’m not sure the Jewel Tea coffee cake was as good as I remember. Thanks for sharing Betsy! I am Dave Heinmiller, Paul Heinmiller’s (your grandfather’s youngest brother born 1927) son. My wife Diane and I would love to have this recipe! Have loved Gert’s coffee cake since 1969. That’s when a friend’s mother made it for breakfast. It’s a childhood memory that I’ve cherish. I’ve told, repeatedly, my husband and children about it all these years, so I’d love to have Gert’s Coffee Cake Recipe. Please send me the recipe! My wife Fiane wants to try this!